A gaming company was looking for a way to streamline their audience segmentation and retargeting practices to make their real-time bidding process more precise and minimize complexity while maintaining ROI. Before, marketers had to create separate audiences based on users’ purchase tiers (high-purchase, medium-purchase, and low-purchase) to send to their programmatic ad partner to determine the real-time bidding amount for users. Using User Attribute Forwarding and Aarki, marketers can create a single audience that includes user attributes, like purchase tier, to fuel mobile retargeting, making it easier to create personalized experiences, inform real-time bidding decisions, and scale targeting initiatives while complying with customers’ consent choices. Aarki is a powerful mobile advertising solution that offers brands an easy way to manage programmatic media buying. When connected to your digital platforms, mParticle collects data from across your customers’ journeys across all of your digital touchpoints and attaches them to persistent customer profiles using deterministic matching. As customers engage with your digital properties, your app and/or web SDKs send data to the mParticle platform, where you can then create highly specific audiences to inform your real-time bidding with Aarki. Using these comprehensive customer profiles, brands can create audiences that can be forwarded to your connected ad platforms based on any number of campaign goals, user attributes, user events, etc. As customers qualify or disqualify themselves from audiences, mParticle automatically moves customers in and out of your audiences and sends updated audience lists to your ad platforms. That means that brands don’t have to spend time manually updating lists and ensures that you’re targeting the right people with the right campaigns. 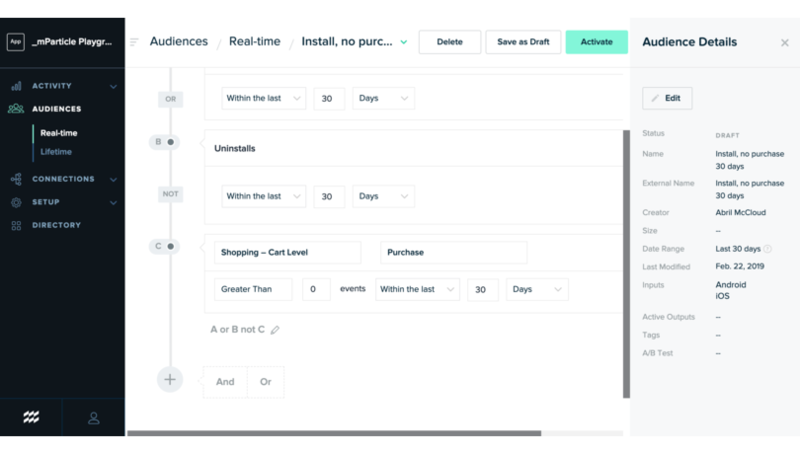 With User Attribute Forwarding, this process is further streamlined by eliminating the need to create several audiences based on user attribute values (like, high, medium, and low purchase tiers). Instead, marketers can create a single audience and forward value-based attributes as a part of the audience for targeting. Available partner platforms that support User Attribute Forwarding currently receive iOS and Android Advertising IDs, but mParticle’s identity features are able to deterministically match attributes to a user from many sources across the mParticle platform at the level of the Workspace and the Account. This means that, if you are tracking a user across multiple platforms, you may be able to forward user attributes that were not collected on the targeted mobile devices to further inform your audience segmentation. If you select a workspace-level attribute, and the same attribute name is used across multiple workspaces in the account, then mParticle will only use values from the audience’s workspace to ensure your audience only contains the most pertinent information and is compliant with consent decisions. Prerequisites: Set up Aarki for programmatic media buying for your mobile apps. 1. In the mParticle platform, go to the Directory and click on the Aarki tile to set up. Select the Audience output for the integration, and click Configure. 2. 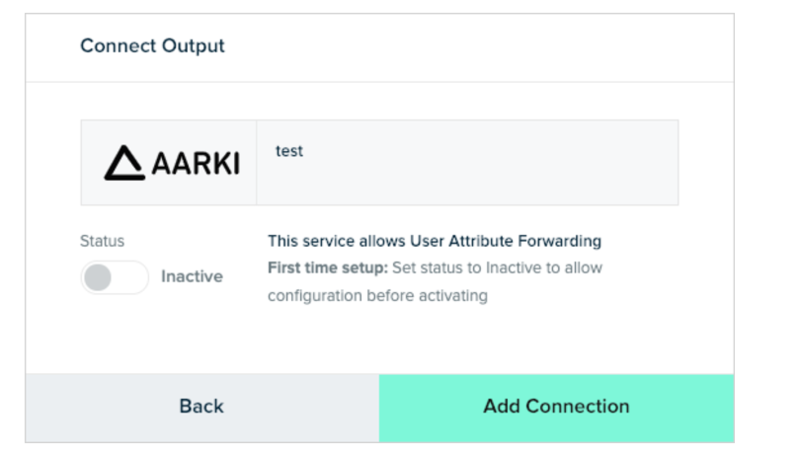 Then, name your configuration and enter your Aarki API key from your Aarki dashboard to allow mParticle to send data to Aarki. Once connected, save your Aarki configuration to use as an output later. 1. Using Audience Builder, create an audience based on customers’ engagements and identifiers. In this case, this audience will focus on customers that have downloaded the app but have not made a purchase in the past 30 days. 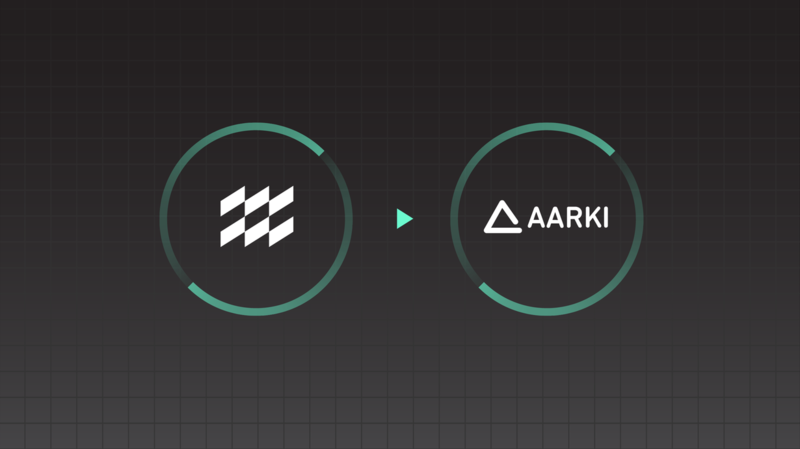 Once this initial scope is defined for the audience segment, Purchase Tier will be added as a user attribute to determine how Aarki will bid for users at separate tiers. 2. To create an audience, click on the Audiences tab in the in-app sidebar. Then click the "New audience" button. Name your audience, choose a date range, and select your input. For this scenario, you’ll want to include iOS and Android as your inputs. 3. Then add your criteria. Here, we’ll create an audience of users that have installed within the last 30 days and exclude users that have uninstalled or have made a purchase. Click save as draft. 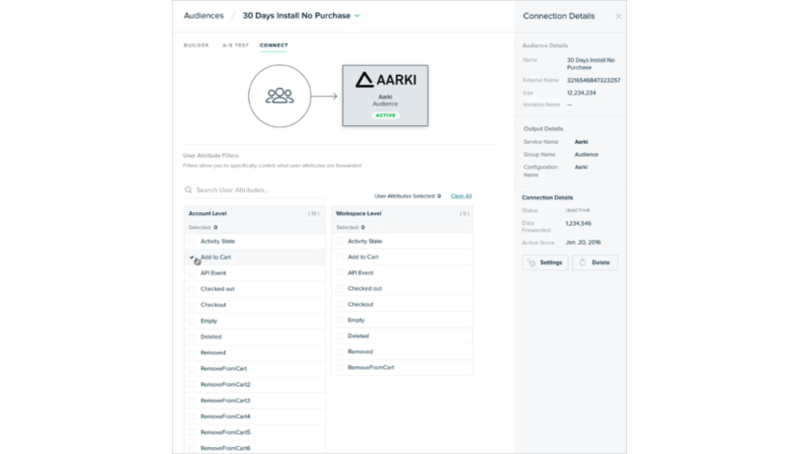 Click on the Connect tab in the audience you built and choose Aarki as the output. You will receive a notification that tells you Aarki supports User Attribute Forwarding. If this is the first time you are setting up User Attribute Sharing, set the status to Inactive to ensure data isn’t sent to Aarki before you have selected the user attributes to forward. 3. Click connect and then select user attributes in the connection screen. By default, all user attributes are disabled. In this case, you would choose either purchase tier or additional attributes that point toward a purchase tier, like add to cart or checkout step, for example. Once you have selected the User Attributes you want to forward, Save and Activate the Audience, open the audience’s Settings and set the Status to Active to begin forwarding identities. Within minutes, selected user attributes will be forwarded to your outputs, providing you with the context needed to inform real-time bidding decisions in Aarki. If you’d like to learn more about how you can use Aarki and mParticle’s audience suite to streamline your audience creation and management to better inform your real-time bidding, you can try this workflow by clicking below or getting in touch. For more information on User Attribute Forwarding, check out this blog.